Quintuplets are a set of five offspring born at one birth. An individual that is part of such a set is called a quintuplet and sometimes referred to as a quint. Quintuplets can be fraternal (multi zygotic), identical (monozygotic) or a combination of both. Multi zygotic quintuplets occur from five unique egg/sperm combinations. Monozygotic multiples are the result of a fertilized egg that splits into two or more embryos. It is possible for a split to occur more than once, producing ​monozygotic triplets or even a rare set of monozygotic quintuplets. Fully monozygotic quintuplets are rare, so rare that it is difficult to assess the odds. Quintuplets can be all male, all female, or a combination of both. (Monozygotic quintuplets will always be of the same gender.) Most quintuplets are a combination of boys and girls; all male or all female quintuples are rare. The first set of all-female quintuplets were born in the United States in 2015. In 2008, a Polish woman gave birth to a set of "probably identical" girls without the aid of fertility drugs. In 2005, the National Vital Statistics report for the United States reported the birth of 68 quintuplets and higher order multiples. Because this number includes the possible birth of sextuplets, septuplets or more, it is not determined exactly how many of those births were quintuplets. The spontaneous conception of quintuplets is rare, the average estimate is 1 in about 60 million births. Most recent quintuplet births are the result of assisted reproductive techniques such as fertility enhancing drugs or in-vitro fertilization. Quintuplets do not always share the same birthdate. A delayed interval delivery (also known as iatrogenic asynchronous birth) may mean that individual babies are born days or even weeks apart. The average gestation for a quintuplet pregnancy is 29 weeks, as opposed to 40 weeks for a full-term baby. The longest gestation I've discovered was 35 weeks, a record held by the mother of the Stanford quintuplets in Rhode Island. Many mothers will gain more than fifty pounds during their pregnancy and will require cervical cerclage, a surgical procedure in which the cervix is sewn shut to prevent preterm labor. Nearly all quintuplet pregnancies result in a cesarean delivery. The average birth weight of a quintuplet is about 2 pounds, 12 ounces and most quintuplets receive medical care in a hospital NICU (Neonatal Intensive Care Unit) until they reach their original birth date. Perhaps the most famous quintuplets are the Dionne Quintuplets born in Canada in 1934. They were the first surviving set of all identical quintuplets. The girls — Annette, Émilie, Yvonne, Cécile, and Marie — attracted worldwide attention. They were removed from their parent's care and placed in the custody of a doctor, who displayed them as a tourist attraction. 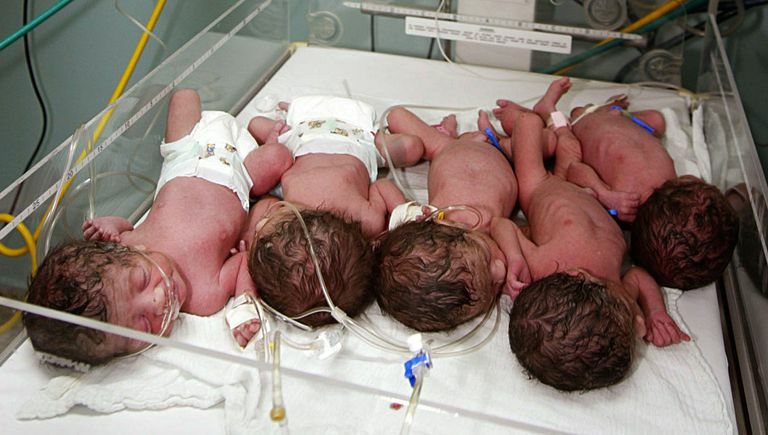 The Wilkinson quintuplets weighed more than 21 pounds combined when they were born at about 34 weeks in 2007. The heaviest quintuplet births on record, according to the Guinness Book of World Records was 25 pounds combined, attributed to two mothers, Liu Saulian (China, 1953) and Mrs. Kamalammal (India, 1956). Parents of quintuplets will change more than 35,000 diapers before their kids are potty trained. The first set of quintuplets born in the United States were reported to be the Kanouse quints in Watertown, Wisconsin in 1875. They were all boys and did not survive. The Fischer quintuplets were the first surviving quintuplets in the United States, born in 1963 in South Dakota, according to Wikipedia. Baseball player Melvin Mora is a dad of quintuplets born in 2001 (3 girls and 2 boys). The mascots of the 2008 Beijing Olympics are quintuplets. A 2004 television show, "Quintuplets" starred Andy Richter and Rebecca Creskoff as parents of teenage quints. The 1994 novel, Feather Crowns, is about a young Kentucky farm couple who gives birth to quintuplets. Five-seat quintuplet strollers are available and are a convenient — though pricey — option for transporting quints. The most prevalent brand is Runabout, a company that crafts multi-seat tandem strollers with hand-welded steel frames. They are quite expensive, costing nearly $1000 new from the manufacturer, but are widely available on the secondary market. Many families find it convenient to use a combination of double and triple strollers to accommodate all five babies. What's the Story Behind the Gosselin Sextuplets?